Isagenix strives to make happy and healthy lifetime customers. As a testament to their confidence in the quality and value of their products, your first order is backed by a 30 day money back guarantee. If you decide Isagenix isn’t right for you for any reason at all within 30 days of your first order, Isagenix will send you a full refund. That’s right; if you’re not 100% satisfied with your first order, you can apply for a full refund any time within the first 30 days! Please note, this only covers the purchase price of the products and doesn’t include any membership or shipping and handling fees. 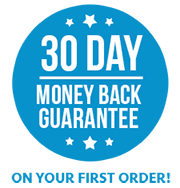 The Isagenix UK 30 day money back guarantee covers the purchase price of any and all Isagenix products you receive on your very first order. Whether you don’t like the taste of a product, aren’t happy with the results, or simply want a refund for any other reason you can think of, you’ll get your money back as long as you request a refund within 30 days. Isagenix products are formulated by nutritionists and put to the test by a dedicated team of fitness and health experts to guarantee their quality, safety, and effectiveness. With people around the world consistently showing outstanding results with Isagenix products, we have nothing but confidence in your ability to achieve your health, weight loss, and performance goals with Isagenix’s multitude of nutritional benefits. Thanks to a money back guarantee, you have absolutely no excuses for not beginning on the path towards health and wellness with Isagenix today. Isagenix has gained a loyal following in a short period of time simply because their products work. Only a small fraction of our customers ever apply for a refund. However, 100% of those who have applied receive a refund in a friendly and timely manner. Contact Isagenix via email at customerserviceUK@isagenixcorp.com. Make sure to include your order invoice number and Isagenix Member ID. You can also call the Isagenix UK customer service team on +44 (0) 808 189 0490 to initiate the refund process. Package and ship the items you’re returning back to Isagenix. Isagenix will credit the original form of payment within 30 days of the product being logged as returned by our distribution centre. If you’re not an Isagenix member, you can apply for a refund using the exact same process. This allows anyone to try out Isagenix and begin transforming their lives for the better absolutely risk free. You truly have nothing to lose, so do yourself a favour and give Isagenix a try today!